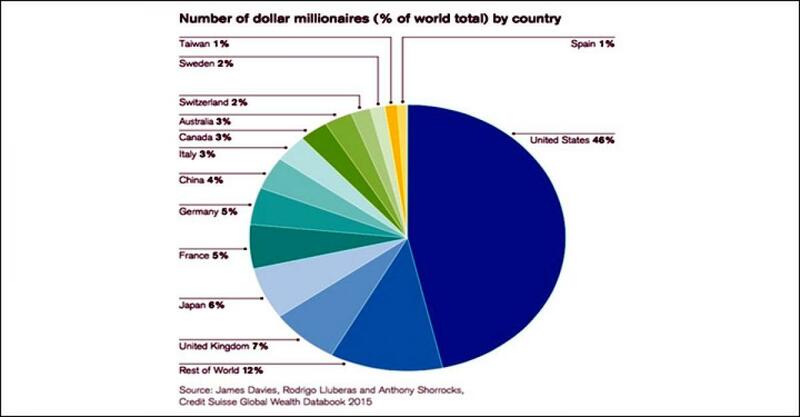 Global wealth inequality continues to worsen and has reached a new milestone, with the top 1 percent owning more of the world’s assets than the bottom 99 percent combined, according to report issued by the Swiss bank Credit Suisse. Of the estimated USD250 trillion in global assets, the top 1 percent owned almost exactly 50 percent, while the bottom 50 percent of humanity owned collectively less than 1 percent. The richest 10 percent owned 87.7 percent of the world’s wealth, leaving 12.3 percent for the bottom 90 percent of the population. The report focused not on the top 1 percent, but on a slightly smaller group, the 0.7 percent of adults with assets of more than 1 million US dollars. This figure includes both financial assets and real assets, such as homes, small businesses and other physical property. 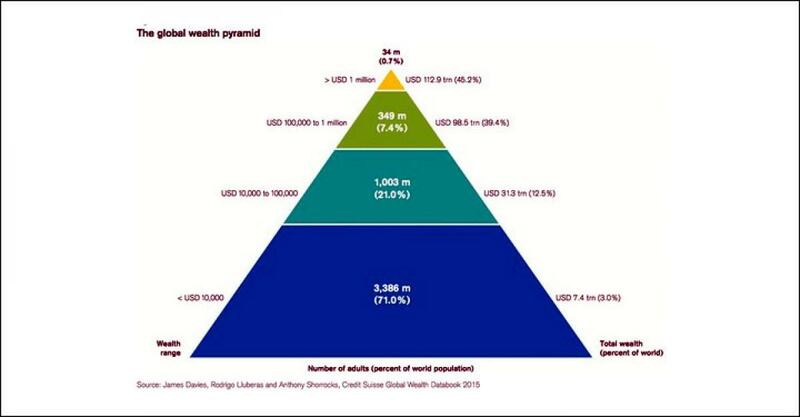 The report’s eye-catching “Global Wealth Pyramid” divides the human race into four categories by wealth: 3.4 billion adults with net assets of less than USD 10,000; 1 billion with net assets from USD 10,000 to USD 100,000; 349 million with net assets from USD100,000 to USD 1 million; and 34 million with net assets over USD 1 million. This top layer, defined by the report as “high-net-worth individuals,” is itself divided very unequally, as shown in a second pyramid: 29.8 million with assets of USD 1 million to USD 5 million; 2.5 million with assets of USD5 million to USD10 million; 1.34 million with assets of USD10 million to USD50 million; and finally, 123,800 with assets over USD50 million. These 123,800 “ultra-high-net-worth individuals,” as the report calls them, are the true global financial aristocracy, exercising decisive sway not only over banks and corporations, but over governments and international institutions as well. Of these, nearly 59,000, almost half the total, live in the United States. Another quarter of individuals are live in Europe (mainly Britain, Germany, Switzerland, France and Italy), followed by China and then Japan. “There are strong reasons to think that the rise in wealth inequality since 2008 is mostly related to the rise in equity prices and to the size of financial assets in the United States and some other high-wealth countries, which together have pushed up the wealth of some of the richest countries and of many of the richest people around the world. The jump in the share of the top percentile to 50 percent this year exceeds the increase expected on the basis of any underlying upward trend. US wealth raised to USD 4.6 trillion, despite a global decline of USD 12.7 trillion, with Japan, Russia and the European Union countries showing the biggest drops, largely because of currency depreciation. Australia and Canada lost USD1.5 trillion in wealth between them, a substantial drop for the two mid-sized economies, which are heavily dependent on resource extraction. China, whose currency is loosely pegged to the dollar, saw a USD 1.5 trillion gain. But this has likely already evaporated, since the report is based on figures ending June 30, 2015 and the Chinese financial markets have plunged 25 percent since then, as the report’s foreword notes.